Did you ever try paneer (or panir as you also see sometimes)? It is an Indian cheese that you can fry and add to al different kinds of sauces. It has a lovely crisp when fried and is a perfect vegetarian alternative when you are longing for something crunchy and filling. And the best thing, it is super easy to make yourself at home with just a few ingredients. 1. Cut the paneer in 1×1 cm dices and fry them in a separate skillet in deodorized coconut oil. Let the baked paneer cool off on a separate plate while you prepare the sauce. 2. Peel and slice the onion in the length. 3. Slice the pak choi in suitable mouth bites. 5. Add some butter or ghee to, a preferably, deep skillet. When melted, add the onion. Bake carefully on low heat until softened. Add the curry paste to the skillet and turn around as it gets warm and develop the flavors. 6. Add the tomatoes and cream to the skillet and turn around. Let it carefully simmer on low heat. After about 5 minutes, add the pak choi and let it simmer in the sauce for another few minutes. 7. 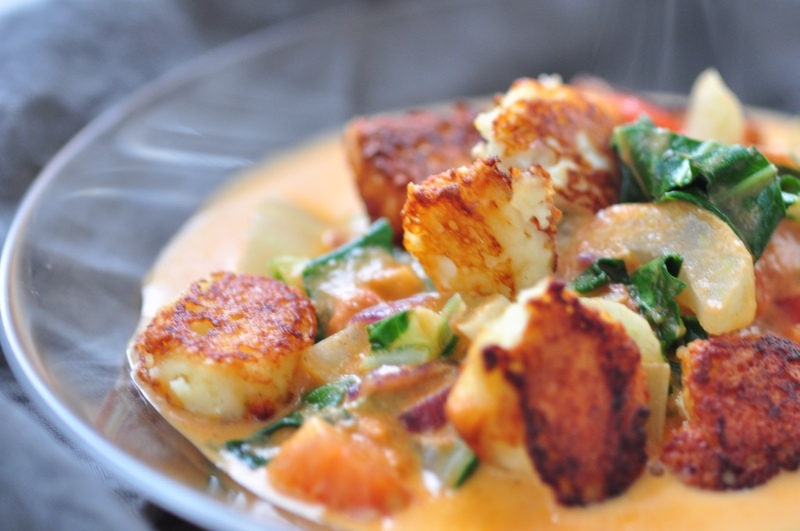 Serve the sauce in a deep plate and sprinkle your fried pieces of paneer on top. For a more fancy version (and very tasty! ), add some chopped cashew nuts and some fresh coriander. This recipe gives about 200 gram ready cheese. You need a cheese cloth or a nutbag to be able to strain the cheese. 1. Prepare a cheese cloth in a colander in the sink. 2. Pour all the milk in a heavy-bottomed pan. Add the salt to the pan. Let it come to a boil on the stove. Turn every now and then with a wooden stick to check so that the milk won’t burn. 3. When the milk is just below 100 degrees (around 93º if using a thermometer), lower the heat and add the lemon juice little by little. Stir the fluid and you will soon see that the milk is sepearating itself in whey and cheese. Continue stirring and adding lemon juice until you have a thick cheese curd. 4. Use a skimmer to catch all the curd and place it in the prepared cheese cloth in the colander. Fold carefully the cloth around the cheese. 5. Place a a big bowl on top of the cheese cloth and fill the bowl with water to make it really heavy. This way you press al the whey out if the cheese. Leave the cheese like this for about 1-3 hours. 6. When al the whey is gone from the curd, you are left with a steady piece of fresh cheese that you cut in pieces without melting when baking. The cheese can be kept in salted water in the refrigerator until the day after if needed. Yum! Love paneer but never think to have it at home, great idea!